Premium Profiles optimize your exposure in our internal as well as all external search engines. 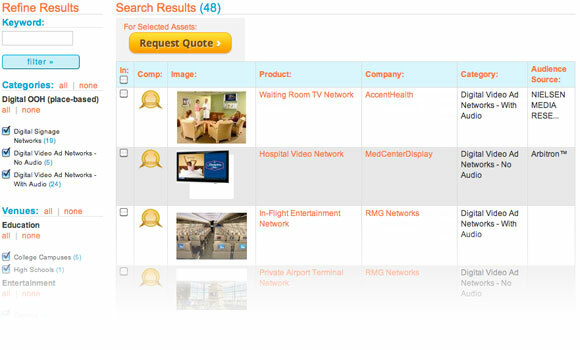 DOmedia’s team builds and customizes your media profiles, with information you provide. A Premium Profile, represented as a unique category/subcategory combination, includes location level detail as well as free leads from request quote traffic. DOmedia will keep your information, including locations, media kits and images, updated with a quarterly audit and incorporate any changes necessary to your profiles. Company and Basic Profiles are still free to create yourself, but the depth of information included with Premium Profiles will increase your visibility significantly. In fact, there was a 45% increase in company profile views and a 63% increase in product profile views during the month of September. Below you can see a chart with the improved profile views for accounts with Premium Profiles. If you want to learn more about Premium Profiles, contact our client services team (clientservices@domedia.com) today! The OAAA’s ‘Take Another Look’ initiative outlined the need to rethink process and expand technology applications. Many agree the lack of standards is holding the industry back, and both buyers and sellers have said they see the value in a common way of distributing RFPs and collecting proposal information. The industry has spoken, and once again we have listened and acted. Many sellers have a proposal tool, which generates an Excel spreadsheet, or PDF that presents information in the way sellers want to sell. The tricky part is when the buyers send out a template, they are trying to guide the way they want to review your proposal. If sellers submit proposals in their own format, it creates more work for the buyers to convert them into a consistent format they can use. Some buyers don’t mind taking the time to convert your proposal information into their template, but for others it’s a hurdle, which can have a negative result for the seller. The buyers do want to understand what sets you apart so they don’t ignore additional information you provide; they just prefer it in their format. This is a simple issue to look out for and getting it right lets the buyer know if the seller is paying attention to their request. “Unit #” is the inventory number or panel id, whereas “# of Units” lets the buyer know if the proposal has multiple faces or is part of a package. There are many times when sellers leave impressions blank or put “N/A” in the column. This puts the buyers in a difficult position. We know there is no apples-to-apples comparison of different media formats because each opportunity is unique, but it is important to try to quantify who is being exposed to the ad. Another issue with impressions is when the seller gives with wrong time unit (weekly versus monthly). This affects the buyer’s calculations. Finally, another hiccup that buyers encounter is when the impressions number is not formatted correctly (i.e. 50MM or 000’s) – be sure to pay attention to the format requested by the buyer. A buyer includes sellers in the RFP that they think can best cover the client’s needs for that campaign. Sometimes an included seller is unable to submit a proposal. 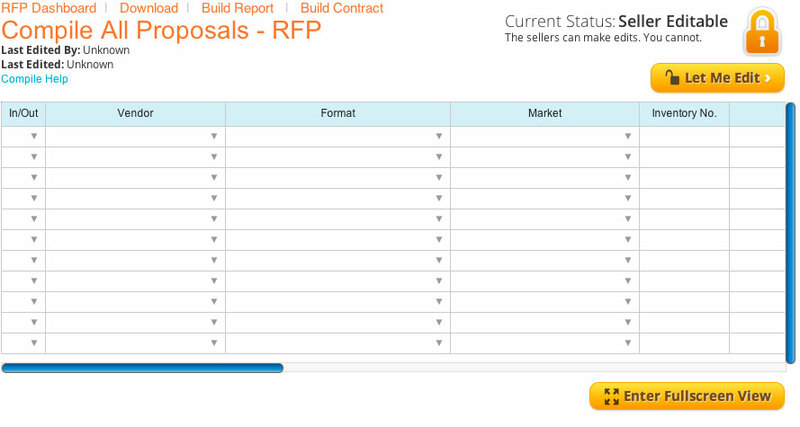 The great thing about the DOmedia RFP tool is that both sides can learn over time what is the cause of seller declining. The seller should clearly define why they are unable to submit (i.e., don’t offer that format, no coverage in that area, no more inventory). This allows the buyers to continue to include the right sellers in the future and also provides insight to profile update requirements. The majority of RFPs have a set of “questions” that need to be answered. However, if the buyer is rushed or sending a simple request, they sometimes elect not to include a template, thereby possibly resulting in incomplete information being given to the seller. This may result in additional communication (and time) between the buyer and seller to fully understand the client needs. DOmedia solved this issue by having a standard brief and “set of questions” (RFP template in 2.0) that are always asked for every RFP. This template can be added to by the buyer; thus allowing flexibility for the buyers while giving the sellers a consistent experience. Capturing rate card pricing seems like a simple thing that is often overlooked. However, when the client wants any kind of reporting on actual vs. rate card costs, it is crucial to have captured this information. It is very time consuming for the seller to backtrack and get rate card pricing after a campaign ended. We know that buyers do not intentionally withhold information about a potential campaign from vendors. A common issue we have observed is missing information from briefs – often as a result of a hurried process. DOmedia’s Project Brief form helps the buyer think through the campaign information in a structured way. Both sides benefit from always having campaign details listed in the same location. Using these “tips” along with DOmedia’s RFP 2.0 application allows buyers and sellers to work faster, smarter and better on behalf of advertising clients. Information can be shared more efficiently thereby freeing up time for both the buyers and sellers to focus on more value added and strategic conversations. All of this helps the industry move forward and reach the objectives set with OAAA’s “Take Another Look” initiative. Every time we turn around, it seems there is even more proof that out-of-home works! Let’s face it, we have always known how effective out-of-home is in reaching our customers and driving results. However, we still love to see even more research confirming our belief, and convincing more people. When Arbitron released its 2013 Out-of-Home Advertising Study, I observed some interesting findings that further establish the idea that OOH gets consumers to take action. This study found that four in ten OOH viewers were encouraged to visit a store or restaurant, or watch a TV show because of an OOH advertisement. Remember the days when getting a high-end brand to try outdoor advertising was next to impossible? Today, looking at the out-of-home brands, that is certainly not the case. According to this study, the OOH media audience is more likely to live in homes with higher incomes. Billboards still take first place in the most viewed OOH media type (Approx. 2/3 of travelers have seen a billboard in the last 30 days), however, 54% of US adults have spent time walking in a town, city or downtown area in the past month. These adults have probably seen many other types of out-of-home media—including interactive displays. Even more amazing was the average time spent walking—3 hours and 52 minutes per week. The findings from this study confirmed that OOH media prompts viewers to make purchase decisions when in crucial decision-making mode. It also validates that OOH engagement and viewership is high. Out-of-home media increases revenue, consumption, buzz, awareness and action. DOmedia is also sharing some enlightening information with the sellers each month. We have released our DOanalytics reports to our sellers so they can evaluate their listings and profiles. Keep an eye out for your seller analytics report to be emailed to your inbox from our client services team. Arbitron Study Methodology: Arbitron and Edison Research completed 912 surveys with U.S. residents aged 18 or older to investigate Americans’ travel habits and their relationship to out-of-home media. The research was conducted in January and February 2013 through telephone interviews using random digit dialing (RDD) landline and cell phone sampling. The survey was offered in both English and Spanish language. Data were weighted to national 18+ population figures. References: 2013 Arbitron Out-of-Home Advertising Study. To see a copy of this study, contact Diane Williams, Sr Media Research Analyst diane.williams@arbitron.com, or visit the Arbitron website.